In this context it is important to remember that ‘demonetisation’ happened in the beginning of November 2016 and we all know what happened after that. Our average consumption definitely did not go up immediately after demonetisation. In fact, many of us were finding it difficult to maintain our usual level of consumption pattern and we were postponing some of the consumption of non-essentials. Very few Indians could actually manage to maintain their consumption pattern with credit card and electronic money. It definitely took more than one – one and half years to overcome the liquidity crisis and the panic associated with it. Our experience tells us that the consumption of commodities and services came down after demonetisation (than before) and aggregate consumption expenditure (at constant prices i.e. after discounting for inflation) definitely did not go up. However, the CSO is asking us to believe that the private final consumption expenditure has not only increased (in real terms) immediately after demonetisation, it has increased at around 8% annual rate at the aggregate level. Even if we believe that the real consumption increased by 8% during April to October 2016, in the second half of financial year 2016-17 and in 2017-18 the growth rate in real consumption should have been at least zero, on average, if not negative. In that case, given the conservative estimates, the growth in consumption expenditure at constant prices should have been around 4% in 2016-17 and that should have been around 0% in 2017-18. 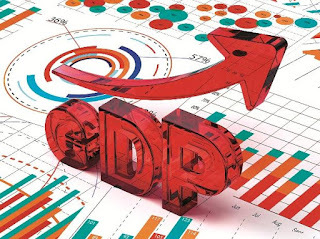 Since, private final consumption expenditure (PFCE) constitutes more than 56% of GDP at constant prices, keeping the other components at their levels, the GDP growth rates would have been less than 6% in 2016-17 and less than 4% in 2017-18. But, CSO numbers are 8.2% and 7.2% respectively. These annual revised estimates and not extrapolated debatable quarterly estimates – they are as good as ‘actuals’. If we look at the dis-aggregated figures for PFCE, we see that there have been negative growth only in consumption of alcohol, tobacco and narcotics and that in communication services. But, the weights of these in total consumption basket are only around 2% each. Food consumption (with 26-28% weight), which was growing at 1.2% in 2014-15 and 1.8% in 2015-16 suddenly grew at 11% rate in 2016-17, in the year of ‘demonetisation’. Clothing and footwear consumption went up by more than 11% in 2017-18. Furnishings, household equipment and routine household maintenance commodity consumption went up by 13% in 2017-18 in real terms. Health, education and transport expenditures have increased phenomenally in both 2016-17 and in 2017-18 even after discounting for their price rise (see table). Real expenditure on hotels and restaurants have also registered around 8% increase in both the years and consumption of miscellaneous goods and services has gone up by more than 10% in the year of ‘demonetisation’ and in the year after that. These are quite remarkable increase in consumption, even after discounting for their respective price rise, following ‘demonetisation’. Even if we take the other CSO numbers on other components of GDP (other than PFCE) viz. government final consumption expenditure (GFCE), investment, export, import etc. for granted, it is difficult to believe in these GDP growth figures, particularly within one and half years of ‘demonetisation’. We know that the aggregate consumption did not rise at 8% rate in the second half of 2016-17 and in 2017-18. There is something seriously wrong. When the researchers would run various regressions using these annual growth figures, in future, for empirical analysis, the results would be contaminated and drawn inferences may also be wrong and misleading. Data should reflect the reality as accurately as possible. Source: CSO Press Note Dated 31st January, 2019. Ministry of Statistics and Programme Implementation, Govt. of India.